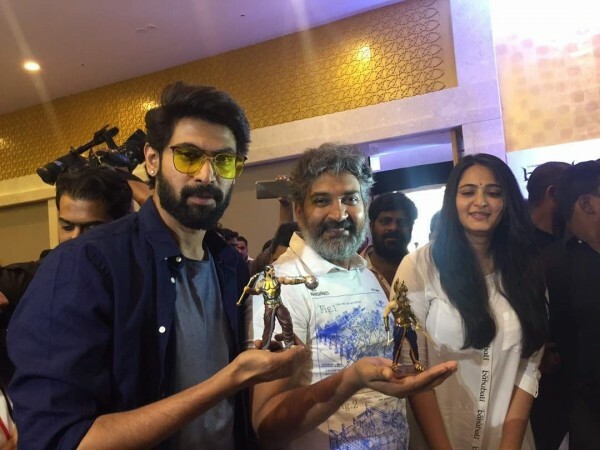 Uday Bhaskar, who runs a software company in Vizag, has made figurines of Amarendra Baahubali (Prabhas) and Bhallaladeva (Rana Daggubati) from Baahubali 2 and put it up for sale on Amazon. Baahubali 2 mania worked wonders at the worldwide box office and now it’s gripping the toys world. The figurines of Prabhas and Rana Daggubati are selling like hot cake. Amarendra Baahubali and Bhallaladeva, two popular characters from SS Rajamouli’s Baahubali franchise, are now available in the form of toys. Uday Bhaskar, the brain behind the idea, is thrilled over the wonderful response for the toys in the market. Uday Bhaskar is the director of a small software company in Vizag. He said he always wanted to make toys based on Indian superheroes and he had even tried hands at the toy version of Chiranjeevi, but things did not fall in place. “We have always had toys based on popular superheroes. I wondered why not toys based on popular movie characters? They could be our own superheroes,” Uday Bhaskar told IANS. “I wanted to make a toy version of Chiranjeevi, and even created a prototype before the release of his film ‘Khaidi No 150’. Unfortunately, the plan didn’t materialise. Finally, things fell in place with ‘Baahubali 2’, and I brought out toys based on the film’s two most popular characters,” Uday Bhaskar added. Uday Bhaskar had a tough time finding a manufacturer. “I went to US and Canada, and realised it wasn’t cost effective. Finally, I decided to get them manufactured from China, where the cost of production is cheaper and there’s no compromise on quality. The toys, manufactured by the company Lilliput Hub, were on sale from April 24. The demand has been phenomenal, he said. You can buy the toys right here.